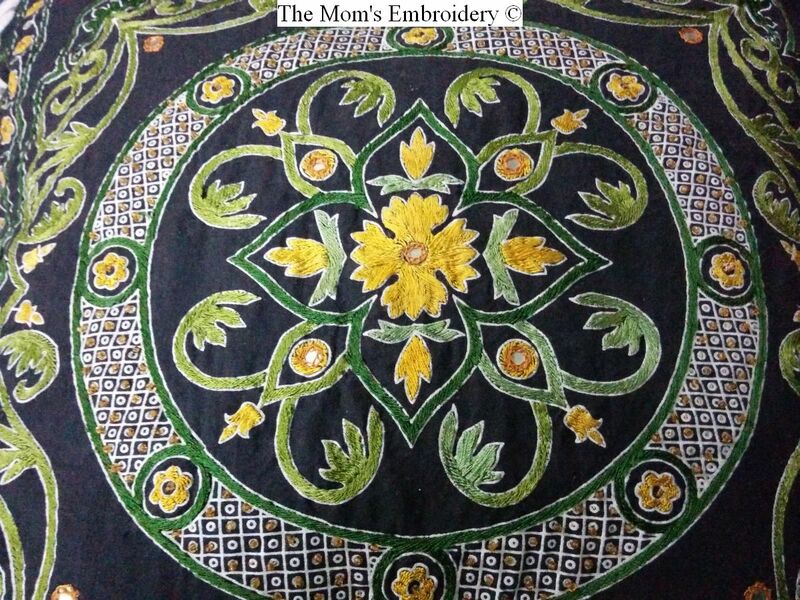 So, now I’ll show you the Basic Pattern of Kutch embroidery. First of all a structure is made. While embroidering the structures, the threaded needle needs to be passed under the immediate previous stitch. 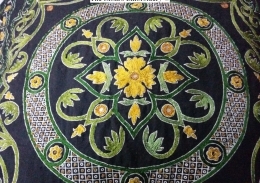 In some cases, this process is not followed when embroidering the kutch chains. 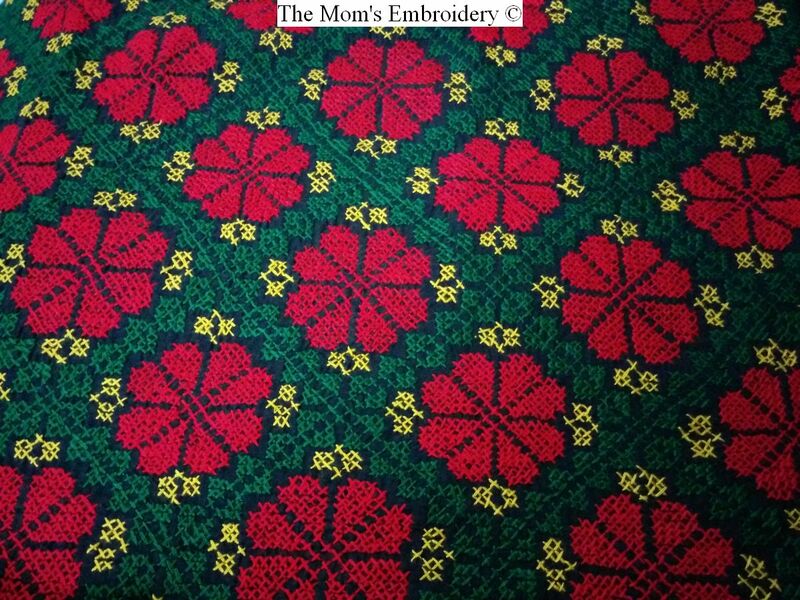 So, lets start the structure of the kutch basic pattern. Here I am adding the alphabets and numbers to every corner of the structure. Note that the numbers and alphabets refer to different points in each corner. 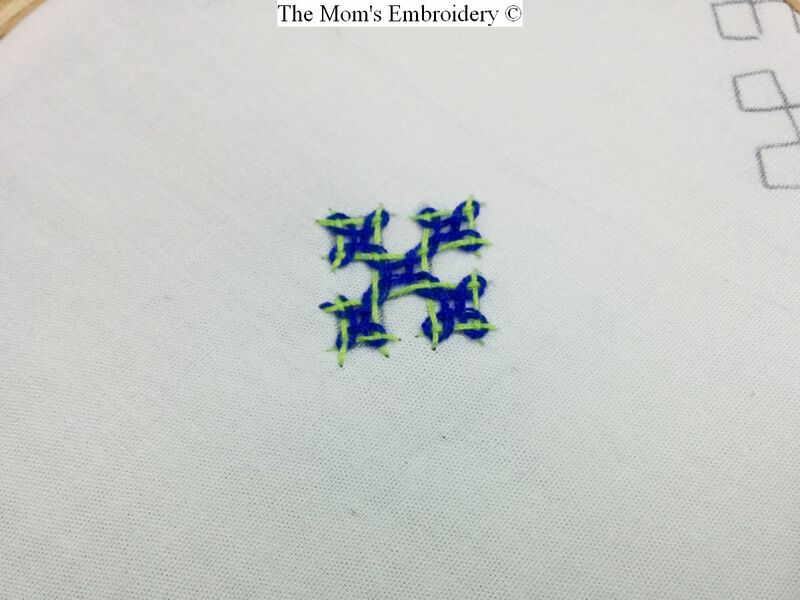 Alphabets are the points, through which we will be pulling the needle up and numbers are the points through which we will be poking the needle down through the fabric. Follow these consecutively to do the embroidery. Pull out the needle through A, poke in through 1. I always start this embroidery with the longer lines of the structure. It feels easier to me. Like, rather than pulling out the needle through L and poking in through 10, I pulled out at A and poked in at 1. 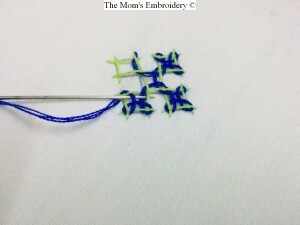 After poking the needle in 1 pull out the needle through B and poke in through 2. Continue this process and make the structure. 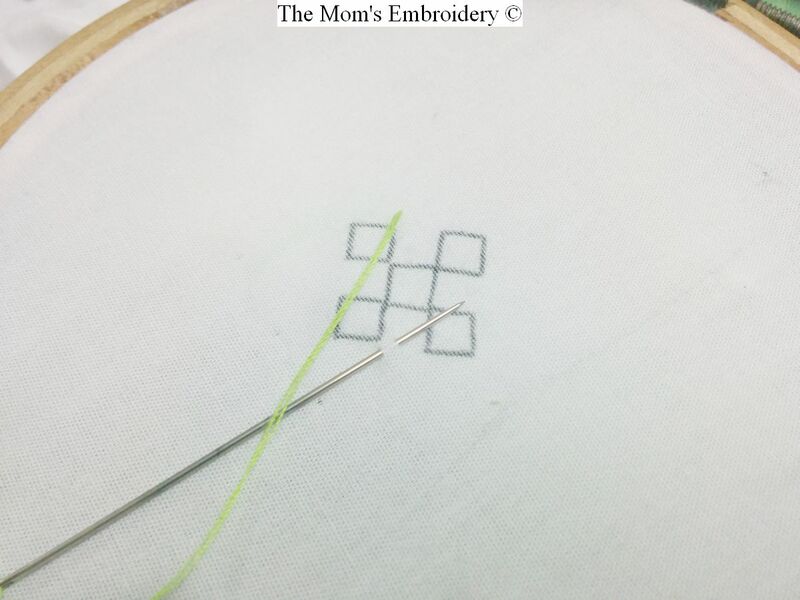 When I am in the corners of the squares, I pass the needle under the previously stitched thread, making sure of having a loop. 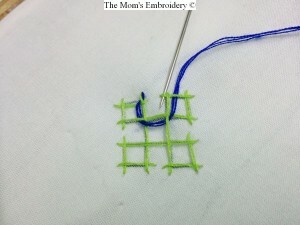 Pass the needle under the previously done stitch. Thus, a loop is created. 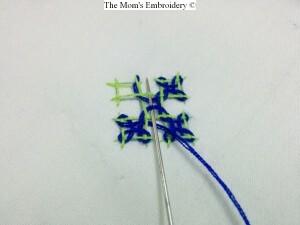 In the last picture, after pulling out the needle, we have two threads ahead. So here you can consider in two ways. 2. You can also consider that the needle was pulled under the previous thread so the needle will go over the next crossing thread and under the second thread. 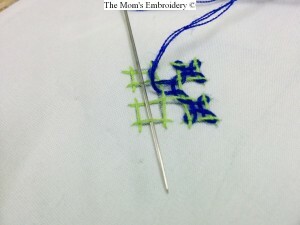 The main target is to make the thread running over other thread, down and make the thread running under other thread, up. 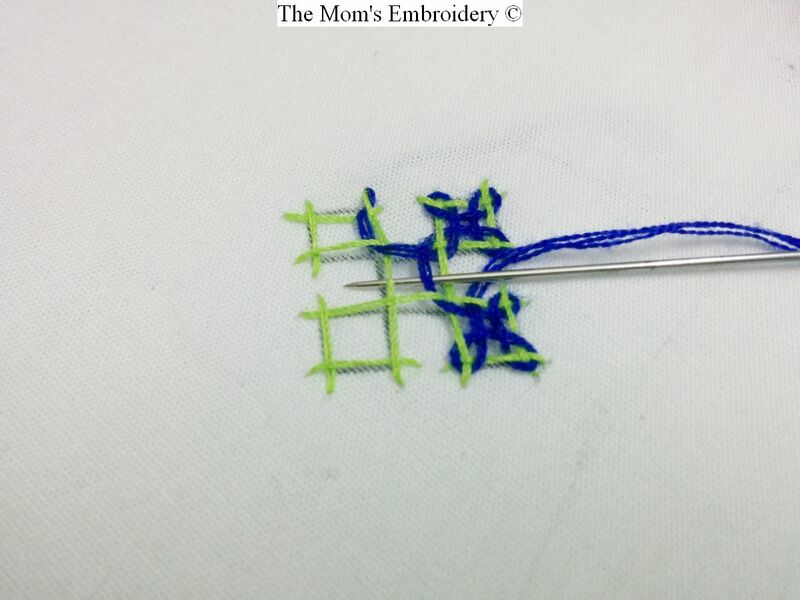 If you have three threads to pass the needle through, then follow the position of the threads. 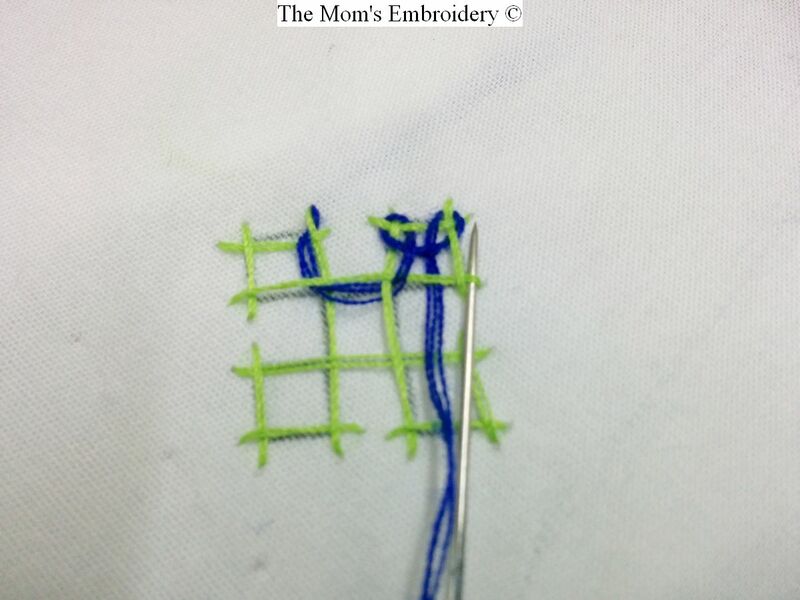 If the position is – under, over, over then the thread will be passed in the same manner- under, over, over. So, follow the crossing thread’s position. 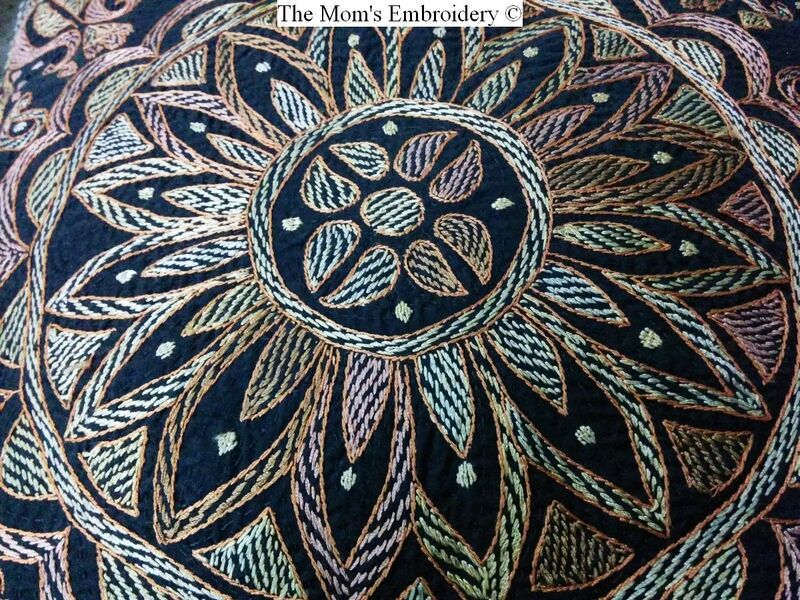 Here is the basic picture guide with some explanations of the second step of kutch work. Remember, there are different ways to do it. This is the process that I follow. 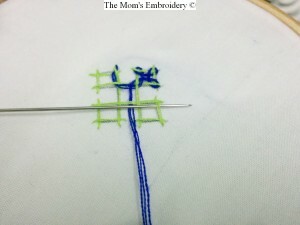 But the common thing is, you have to play your needle up and down through the previous threads of structure. So lets start. 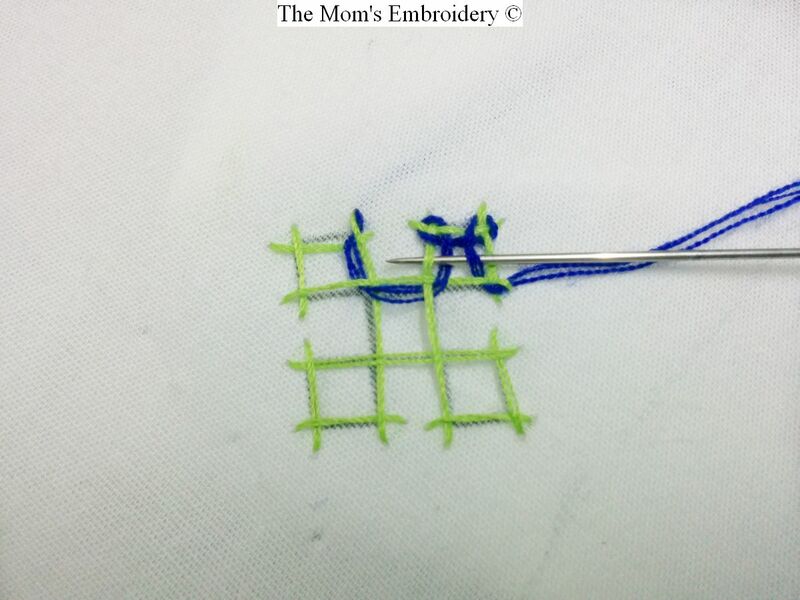 Pull out the thread through the fabric in the same corner where you finished embroidering the structure. 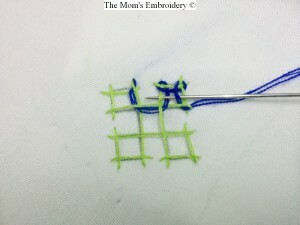 Now, run the thread over the next crossing thread in the corner. 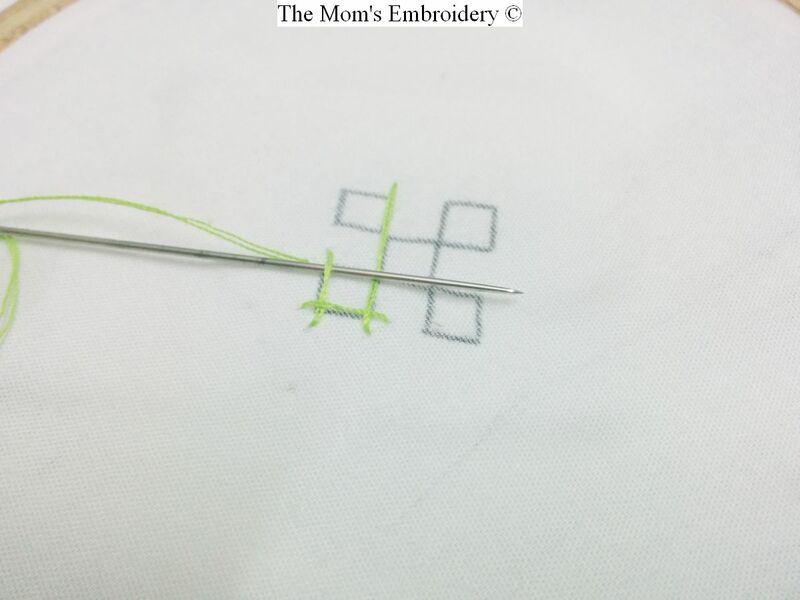 In this point you are drawing your working thread towards the left. 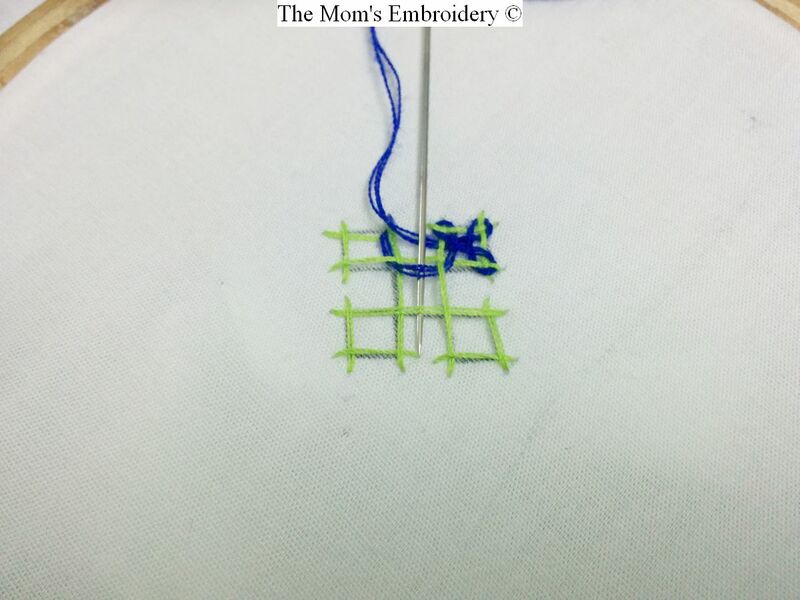 After this, you’ll have to insert the thread in the immediate box. 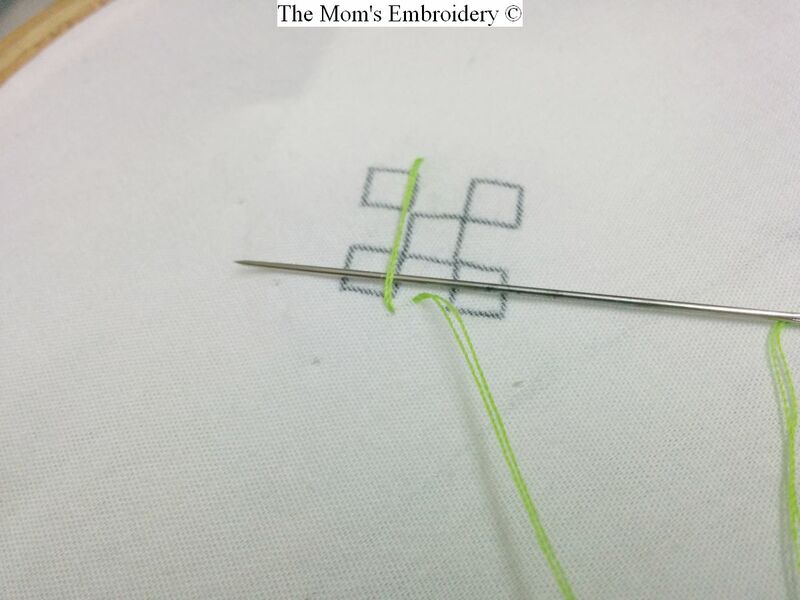 So, you have to take your thread towards left. 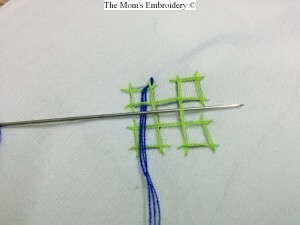 While entering the box, you’ll have to see the positions of threads of the structure. 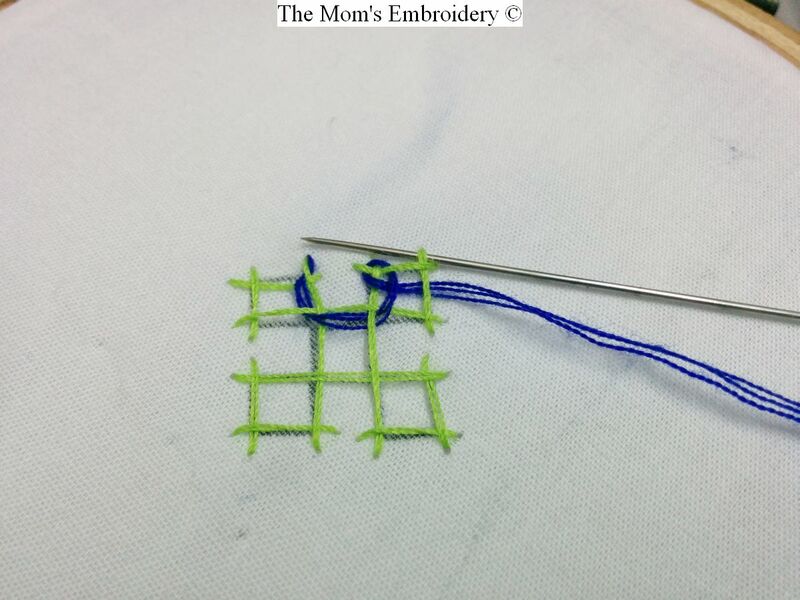 Remember, whenever you are crossing a thread, you should look on the left corner threads/ just crossing threads. Here you’ll see, the first crossing thread is over other thread and second crossing thread is under the other thread. 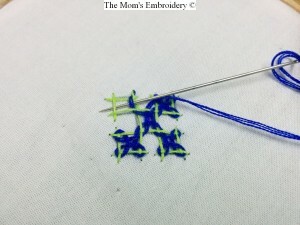 You have to put the first one under the working thread. 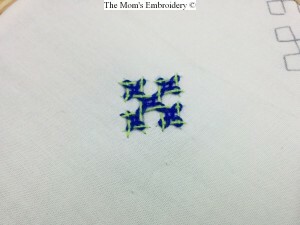 And second one over the working thread. 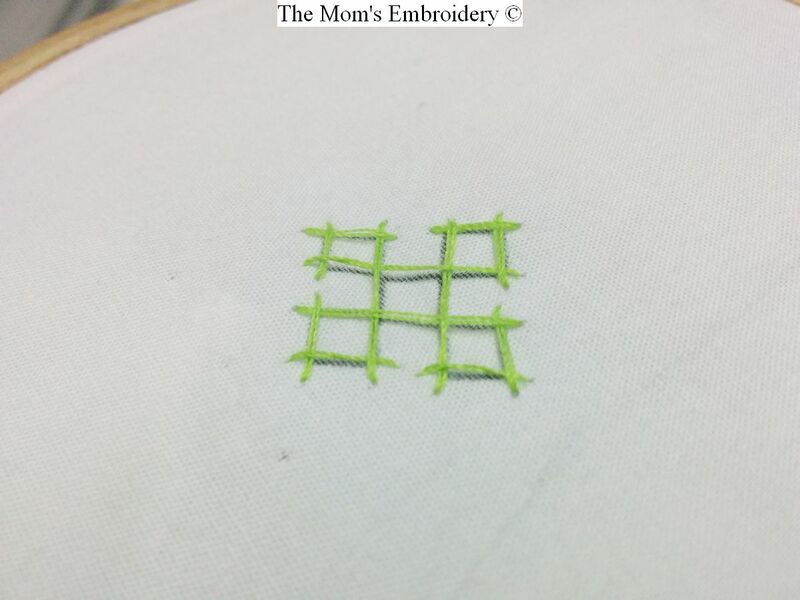 The first square is not completed properly. 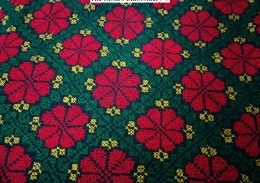 The filling up of the squares just starts from this square. Now you have to go to the parallel square through the middle square. For this, run the thread towards left. 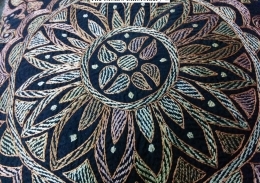 Here, the first crossing thread will be over the other thread and the second will be under other thread. 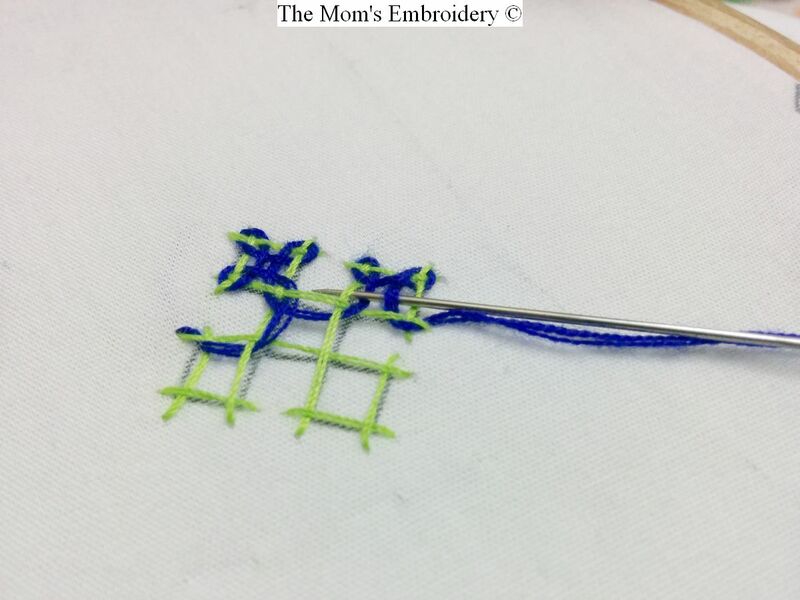 So pass the needle over the first one and under the second one to make the first crossing thread under the working thread and second crossing thread over the working thread. 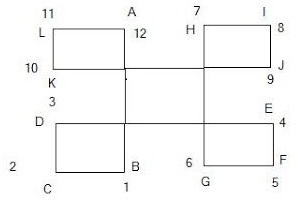 After this, you will be entering the parallel (to the first square) square. Again you have to take the thread toward left. First crossing thread is over the other thread and the second one is under. So, run the needle over the first one and under the second one. Run the thread through the corners of the current square. 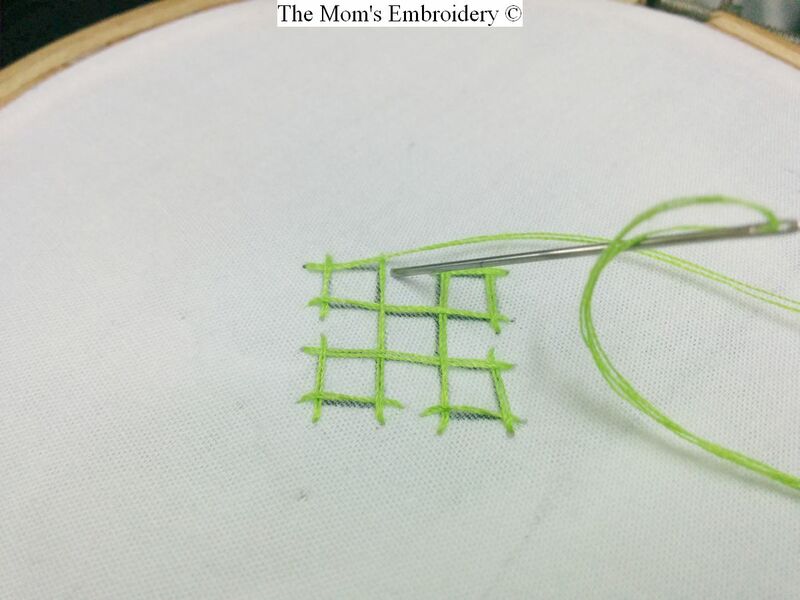 In the corner, you will run the thread over the first crossing thread and under the second crossing thread. 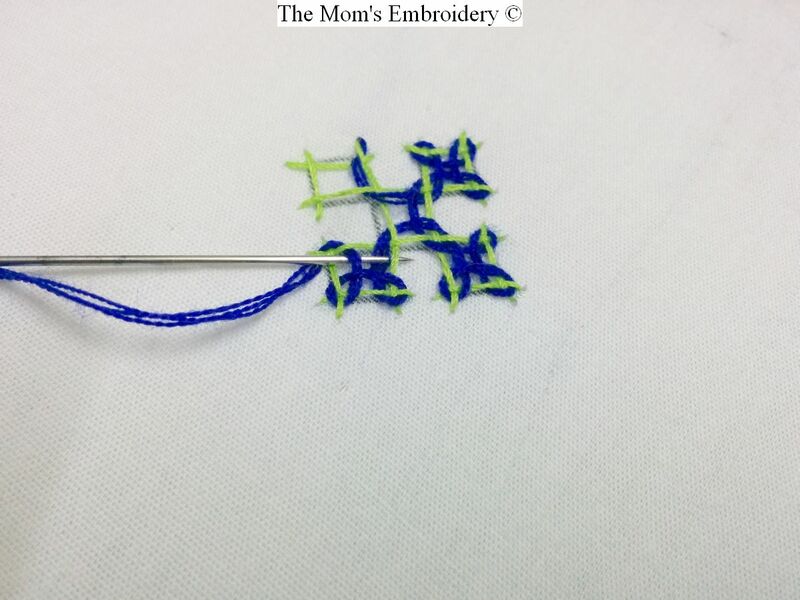 Remember, while doing this embroidery you have to take the thread in left hand side and have to always alternate the position of the threads with the working thread (upper one goes down and the lower one comes up). You will have to fill up this square. After running the working thread through the corner, you will see three threads infront. 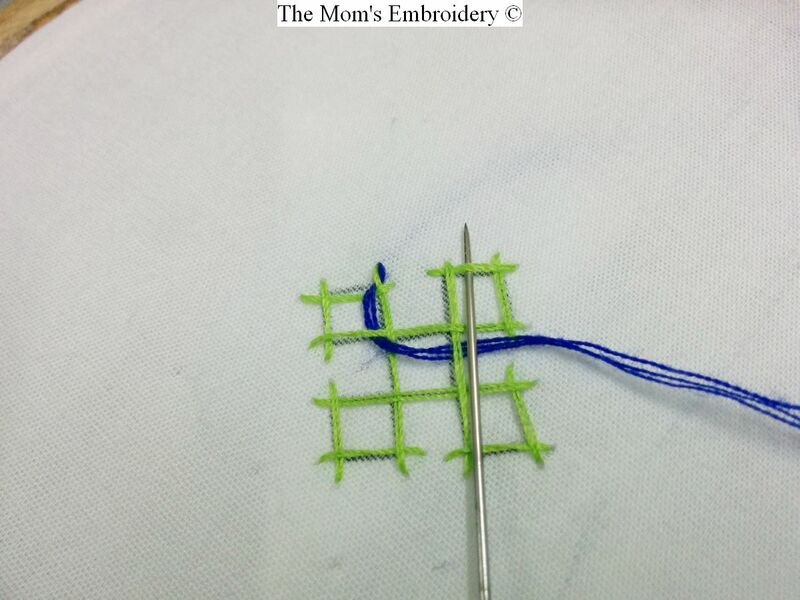 Now, take a look at the left side to understand the crossing pattern of the threads. Here, the position of the threads will be, the first one is over and the next two will be under. 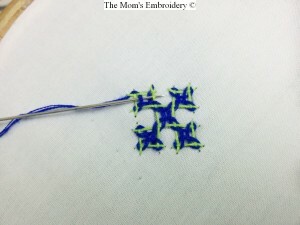 Run the working thread over the first one and under the second and third one. 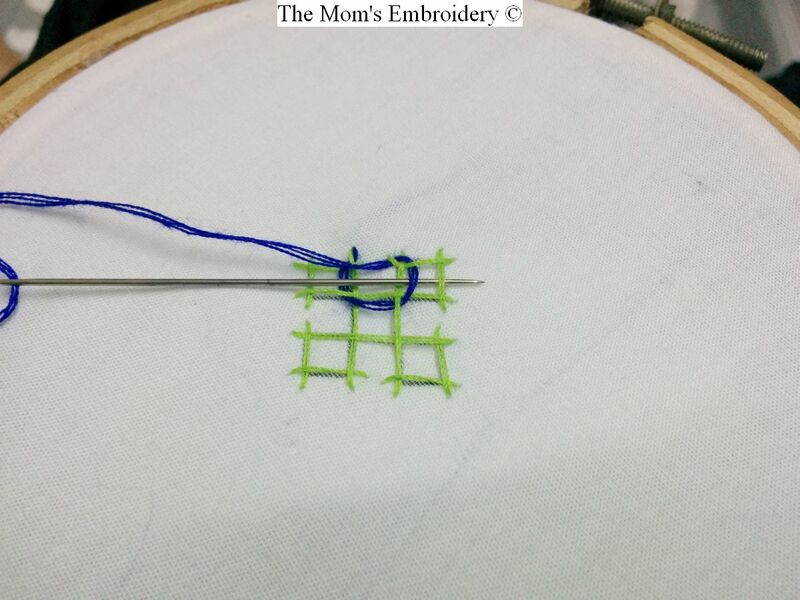 Take the needle to the left and run the working thread through the left corner. 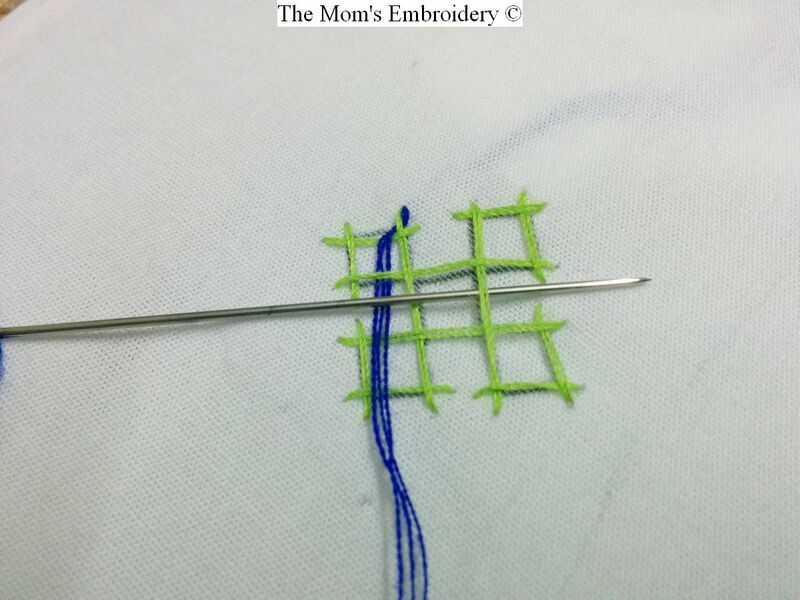 After this, you will have three threads to pass, having similar positions like before. So follow the previous step. Put the first one under and the other two over the working thread. Then cross the thread through the remaining outer corner of this particular square. 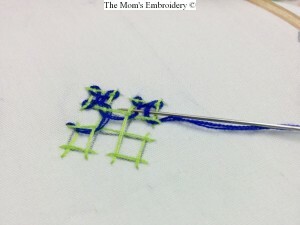 Run the thread over the first crossing thread and under the second crossing thread in the corner. After this, there will be four crossing threads laying in front. 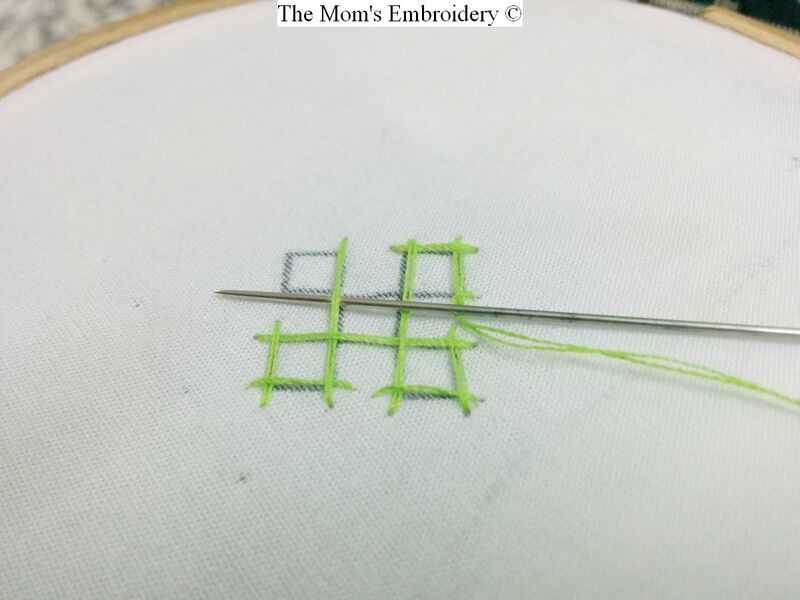 In the left, the crossing positions of the threads would be- first one will be over, second one will be under, third one will be over and the fourth one will be under. Run the needle in a over, under, over, under manner. After the square is done, pull the thread towards left and go to the left square of the structure through the middle square. 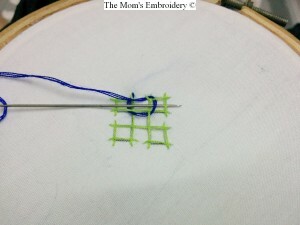 In the middle you’ll have three crossing threads positioning over, under, under. So, make it under, over, over, Then enter and complete the left square following the same process of completing the second square. 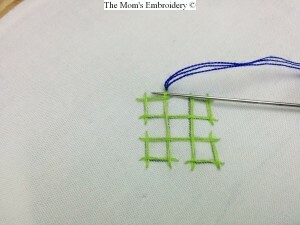 Once the third square is done, pass the middle square and go to the fourth square for filling it up. In the middle square, there will be three crossing threads again. The position will be over, under, under. So make these under, over, over. 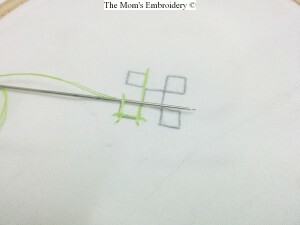 After this, take the thread towards left square, where there will be two crossing threads. The positions will be over, under. Make it under, over. 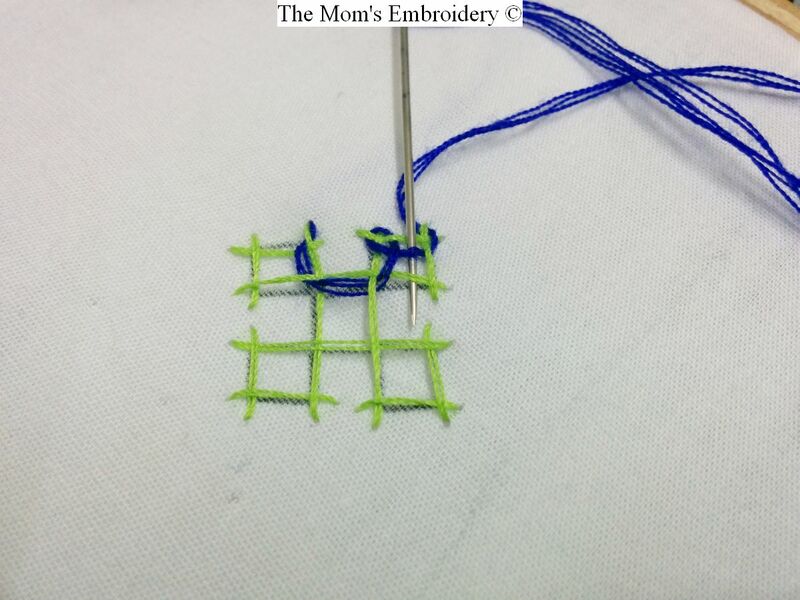 And follow the rest of the process of filling up the square just like the second or third one.After completing the fourth square you will enter the middle square to complete the filling up of the middle and first square. While entering the middle square, you will get four crossing threads. 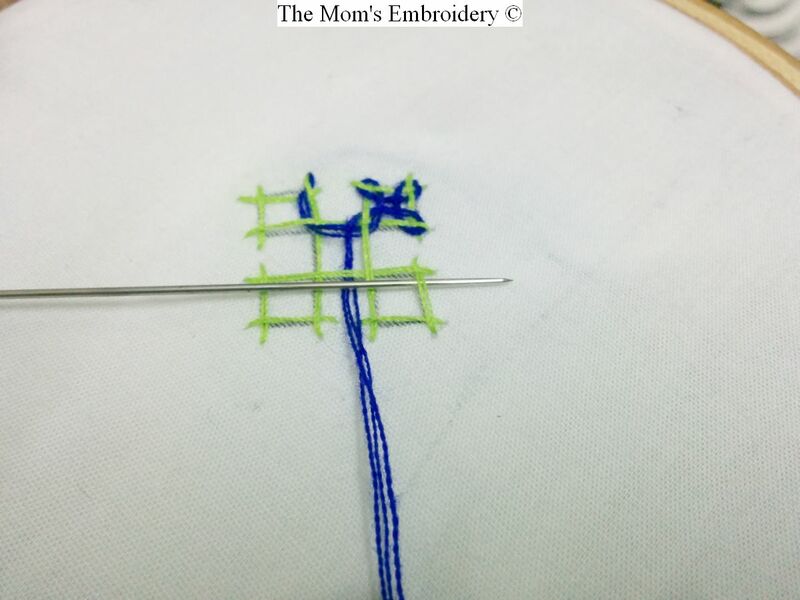 Run the working thread according to the position of the crossing threads. 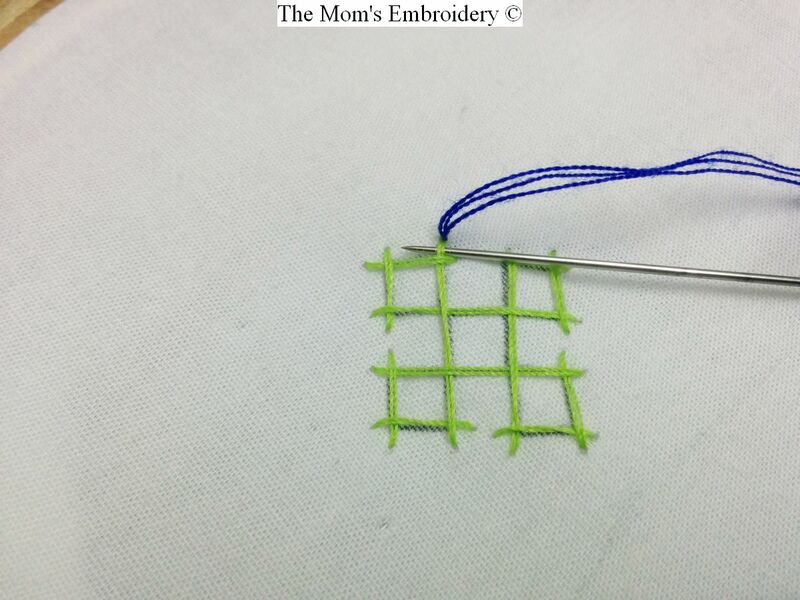 When the middle square is filled up (has four vertical and four horizontal threads), return to the first square. Complete filling it up just like the previous squares.